We specialize in all your residential Air Duct cleaning needs! When was the last time you had your air ducts cleaned or inspected? 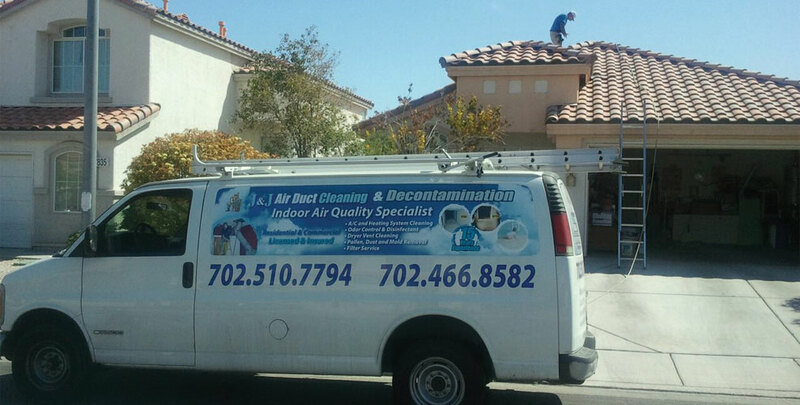 J & J Air Duct offers the best in residential air duct cleaning services. We’ve been serving the Las Vegas valley area since 2001, and have the experience and the best equipment to do the job. Additionally, we offer excellent and competitive prices. No job is too small or too big for us; call us for a free phone quote or get a speedy fast quote here. At J & J, we do a thorough sweep through your HVAC system and address each part to ensure optimal operation. The supply and return grills. The interior surfaces of the supply and return duct works; including all the main branches or main ducts coming out of the air unit. The furnace/air conditioner air handler. This could be located on the roof, in the garage, the attic, or a closet. All 3 components must be properly accessed and cleaned using the right procedures and equipment to ensure the best result. If only one or two of the components are cleaned, the contaminates from the 3rd component will rapidly contaminate the pieces that were cleaned. Be wary of companies who claim differently, they may be trying to give you a run for your money. Additionally, be cautious of companies who may come and put any type of equipment (brushes and extensions) or unauthorized chemicals into your ductwork system, they may just make it worse! J & J Air Duct Cleaning & Decontamination has the appropriate professional equipment to get the job done for multiple systems (flex, metal, fiberboard etc. ), without damaging the interior surface of your ducts. At J & J you get the expertise of duct cleaning professionals who will get your residential ducts cleaned right the first time! If you’re curious about our home HVAC cleaning services, don’t hesitate to get in touch with us, or get started with a free quote. We also provide air filter change services, and dryer vent duct cleaning.